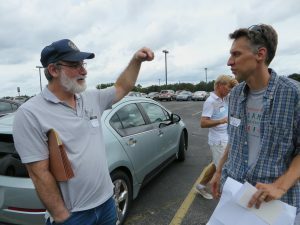 Orlando, FL – Drivers of electric cars – and more than 100 folks who are interested in electric cars – will descend on Valencia College’s West Campus on Saturday, Sept. 10, for a “tailpipe-free” tailgate party, to demonstrate the clean-air benefits, cost-savings and fun of driving electric cars. The Orlando event is one of more than 100 across the country where electric-vehicle owners (also known as “EV-angelists”) will hold electric car parades and a series of events, plus launching of new public EV charging stations. At the event, you can see a wide array of electric vehicles (including Nissan Leafs, Chevy Volts, Tesla Model S vehicles, BMW i3, Ford C-MAX Energi, and 1 solar vehicle) and talk to their owners. Speakers will also discuss the energy and environmental aspects of the electric-car movement, and learn the science behind sustainable living and renewable energy. The Orlando event is organized by Valencia College and supported by the Electric Auto Association, Plug In America and the Sierra Club. About the Sierra Club: The Sierra Club is the nation’s oldest and largest grassroots environmental organization with more than 2.4 million members and supporters, with chapters in all 50 states. The Sierra Club’s national electric vehicles initiative advocates for a switch to EVs as one important way to reduce emissions and cut oil consumption.